London Vet Show is Europe’s premier two-day, conference-led exhibition for veterinary professionals, run in association with the globally recognised Royal Veterinary College and the British Veterinary Association. 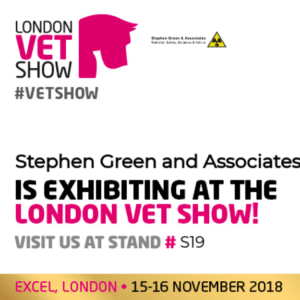 Stephen Green and Associates will be hosting a stand at the London Vet Show where you will be able to meet and greet our friendly team. This is also a good chance to find out what services we can offer your company, from No Nonsense Compliance Solutions, state of the art personal dosimetry technology and relevant training courses. Come and find us at stand S19 and enter our exciting competition. Each day we are offering fantastic prizes! Free Radiation Protection Services for a ‘one set’ Veterinary Practice for one year. Simply leave us your contact details. There is no purchase requirement to enter the draw. Entry is restricted to one entry per person per prize draw please. Third party entries will be disqualified. Prizes are valid for UK organisations only. Winners will be chosen at random each day from all valid entries. Winners will be contacted via email no later than the 30th November 2018. The random draw is final, and no correspondence will be entered in to. Each prize draw competition will run daily for the duration of the London Vet Show (15th & 16th November 2018]. Stephen Green and Associates Ltd is GDPR compliant. Our policy is such that we will not pass on your details to any third party.